myinvestingnotes.blogspot.my (Bullbear Buffett Stock Investing Notes): To avoid falling into a value trap, an investor must always keep asking, "why"? Keep INVESTING Simple and Safe (KISS) ****Investment Philosophy, Strategy and various Valuation Methods**** The same forces that bring risk into investing in the stock market also make possible the large gains many investors enjoy. It’s true that the fluctuations in the market make for losses as well as gains but if you have a proven strategy and stick with it over the long term you will be a winner! ****Warren Buffett: Rule No. 1 - Never lose money. Rule No. 2 - Never forget Rule No. 1. To avoid falling into a value trap, an investor must always keep asking, "why"? Once you find an undervalued security trading at a substantial discount to your estimate of intrinsic value, your job is not over. "Why is the stock trading at this level and what catalysts will lead to its eventual reversal?" If you cannot answer this question, you should not be investing in the stock. This is second level thinking (Howard Marks) and it will keep you from falling into a value trap. An investor must always keep asking, "why"? What is the overarching reasoning or justification behind this particular scenario or occurrence? When you have those answers, you have to ascertain why the other side may (or may not) be wrong. Is there are mispricing here? There was a major disconnect between perception and reality - between the stock price and the intrinsic value of the business. Why? There can be from any number of reasons. Usually one or the other side is wrong from psychological or analytical misjudgements (sometimes both). Most mispricings are due to psychological ... fear of loss / fear of missing out. Mispricings due to analysis is very rare ... we're usually not smarter than the other investors. This is opportunity cost at its finest action. Click here to take you to the page. The objective of fundamental analysis is to determine a company's intrinsic value or its growth prospects. who held their original shares unwaveringly while they increased 10-fold or 100-fold or more in value? Be a good stock picker. Think as a business owner. Always look at value rather than the price. Do the homework. Buy and hold is alright for selected stocks. 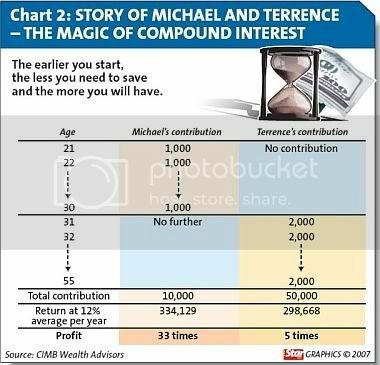 Compounding is your friend, get this to work its magic. Mr. Market is there to be taken advantage of. Do not be the sucker instead. BFS;STS. Always buy a lot when the price is low. Never buy when the stock is overpriced. It is alright to buy when the selected stock is at a fair price. Phasing in or dollar cost averaging is safe for such stocks during a downtrend, unless the price is still obviously too high. Do not time the market for such or any stocks. By keeping to the above strategy, the returns will be delivered through the growth of the company's business. So, when do you sell the stock? Almost never, as long as the fundamentals remain sound and the future prospects intact. The downside risk is protected through only buying when the price is low or fairly priced. Tactical dynamic asset allocation or rebalancing based on valuation can be employed but this sounds easier than is practical, except in extreme market situations. Sell urgently when the company business fundamental has deteriorated irreversibly. You may also wish to sell should the growth of the company has obviously slowed and you can reinvest into another company with greater growth potential of similar quality. However, unlike point 16, you can do so leisurely. In conclusion, a critical key to successful investing is in your stock picking ability. A one-minute clip where Charlie Munger mentions their four "investing filters"
What money means to you? How can the average investor improves his investment returns in stocks? Discovered any GEMS? Share here. 1. Behind every stock is a company. Find out what it’s doing. 2. Never invest in any idea you can’t illustrate with a crayon. 3. Over the short term, there may be no correlation between the success of a company’s operations and the success of its stock. Over the long term, there’s a 100% correlation. 4. 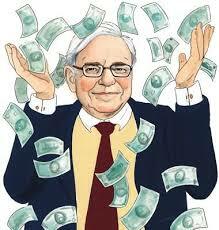 Buying stocks without studying the companies is the same as playing poker – and never looking at your cards. 5. Time is on your side when you own shares of superior companies. 6. Owning stock is like having children. Don’t get involved with more than you can handle. 7. When the insiders are buying, it’s a good sign. 8. Unless you’re a short seller, it never pays to be pessimistic. 9. A stock market decline is as predictable as a January blizzard in Colorado. If you’re prepared, it can’t hurt you. 10. Everyone has the brainpower to make money in stocks. Not everyone has the stomach. 11. Nobody can predict interest rates, the future direction of the economy, or the stock market. Dismiss all such forecasts and concentrate on what’s actually happening to the companies in which you’ve invested. Lynch’s advice had a profound effect on my stock market approach. He taught me that investment success isn’t the result of developing the right macro-economic view or deciding when to jump in or out of the market. Success is about researching companies to identify those that are likely to report positive surprises. Think of your physical, mental and social well-being. Money may not buy happiness. The major RISK facing you is the possibility of not reaching your long-term investment goal through the growth of your funds in real terms. And the greatest enemy of reaching those goals is INFLATION. Nothing is safe from inflation. Short-term price volatility is NOT risk for investors who have time horizons 5, 10, 15 or 30 years away. Volatility is the friend of the long term investor. The most important friends of your investment goal are COMPOUNDING and TIME. A great company with a Durable Competitive Advantage will have a ratio of Capital Expenditures to Net Income of less than 25%. Less is better. A good company will have a ratio of Capital Expenditures to Net Income of less than 50%. A great company with a Durable Competitive Advantage will have a ratio of less than 25%. Growing at 15% a year - what does this entail? What to Do in a Up (Bull) Market? What to Do in a Down (Bear) Market? The 2008 bear market - Congratulations, you succeeded! A challenge to active investors - Is it time for a re-think? The consequences must dominate the probabilities. Buy and hold until fundamentals change is safe for selected stocks. News you could use - "SALE! 50% OFF!" Keep your money for investing separate from those for speculating. Which type of Company would you rather own? Finding great companies: What you want to see on their financial statements? The lower the capital used to achieve a certain level of growth, the higher the intrinsic value. The true value is determined by the intrinsic value of the company and not the dividends. Keep it simple. Keep it safe (make money with less risk taking). You don't need to pick the best stock or even the best stock funds to do well, if you have an investment strategy that keeps you out of trouble. The true investor scarcely ever is forced to sell his shares, and at all times he is free to disregard the current price quotation. He need pay attention to it and act upon it only to the extent that it suits his book, and no more. Thus the investor who permits himself to be stampeded or unduly worried by unjustified market declines in his holdings is perversely transforming his basic advantage into a basic disadvantage. That man would be better off if his stocks had no market quotation at all, for he would then be spared the mental anguish caused him by other persons' mistakes of judgement." "The refusal to sell at a loss, while completely natural and normal, is probably one of the most dangerous in which we can indulge ourselves in the entire investment process. More money has probably been lost by investors holding a stock they really did not want until they could 'at least come out even' than from any other single reason. If to these actual losses are added the profits that might have been made through the proper reinvestment of these funds if such reinvestment had been made when the mistake was first realized, the cost of self-indulgence becomes truly tremendous." Investment performance is not guaranteed and future returns may differ from past returns. As investment conditions change over time, past returns should not be used to predict future returns. The results of your investing will be affected by a number of factors, including the performance of the investment markets in which you invest. Knowing all that you now know and expect about the company and its stock (not what you originally believed or hoped at time of purchase), and assuming that you had available capital, and assuming that it would not cause a portfolio imbalance to do so, would you buy this stock today, at today's price? No equivocation. Yes or no? Answers such as maybe or probably are not acceptable since they are ways of dodging the issue. No investor probably buys a stock; they either place an order or do not. Here is the implication of your answer to that critical test: if you did not answer with a clear affirmative, you should sell; only if you said a strong yes, are you justified to hold. • A rising trend of earnings dividends and book value per share. • A balance sheet with less debt than other companies in its particular industry. • A P/E ratio no higher than average. • A dividend yield that suits your particular needs. • A below-average dividend pay-out ratio. • A history of earnings and dividends not pockmarked by erratic ups and downs. • Companies whose ROE is 15 or better. • A ratio of price to cash flow (P/CF) that is not too high when compared to other stocks in the same industry. My site is worth$14,936.64Your website value? "To achieve satisfactory investment results is easier than most people realise; to achieve superior results is harder than it looks." Sell the losers, let the winners run. Losers refer NOT to those stocks with the depressed prices but to those whose revenues and earnings aren't capable of growing adequately. Weed out these losers and reinvest the cash into other stocks with better revenues and earnings potential for higher returns. The high CAGR in the early years of the investing period, due to buying at a discount, tended to decline and approach that of the intrinsic EPS GR of the companies over a longer investment time-frame. Observation over many years has taught us that the chief losses to investors come from the purchase of low-quality securities at times of favorable business conditions. Basically, Graham is saying that most stock investors lose money because they invest in companies that seem good at a particular point in time, but are lacking the fundamentals of a long-lasting stable company. This seems obvious on the surface, but it’s actually a great argument for thinking more carefully about your individual stock investments. If most of your losses come from buying companies that seem healthy but really aren’t, isn’t that a profound argument for carefully studying any company you might invest in? Note carefully what Graham is saying here. It is not just possible, but probable, that most of the stocks you own will gain at least 50% from their lowest price and lose at least 33% ("equivalent one-third") from their highest price -regardless of which stocks you own or whether the market as a whole goes up or down. If you can't live with that - or you think your portfolio is somehow magically exempt from it - then you are not yet entitled to call yourself an investor. Successful investing is not magic, just keep things simple and maybe follow few investing and money rules of thumb and you’ll be fine in the long run.